What is main difference between Digital and Analog LED strips? We start this blog with comparison below that shows main differences between Analog and Digital LED strips. Generally, analog strips allow you to change color of the strip, but you can get only one color on the strip at once. They are usually used to illuminate places that lack natural sunlight, as decorations in clubs, TV studios or on buildings on either exterior or interior. Analog LED strip can only have one color at a time. Analog strips are frequently controlled with DMX protocol or using remote controls. In case you use single color analog LED strips (usually white), you are able to connect them directly into the power source. But the most common way of controlling analog LED strips is over DMX signal. This allows you to change color of the strips using standard DMX lightning console (or software). Typically, analog LED strips use 12V, 24V or 220V voltage. They are normally distributed in 5m rolls and use 60 LED diodes per meter (but there are also less or more LEDs per meter versions available). Digital LED strips are also called video, dream, pixel or addressable LED strips. They all fall within the same category. The main benefit comparing to analog LED strips is that you can control every single LED diode separately. This allows you to use digital LED strips to display even video. Traditionally, it is achieved thanks to additional chips (IC) directly inside the LED diode or on the digital strip board. 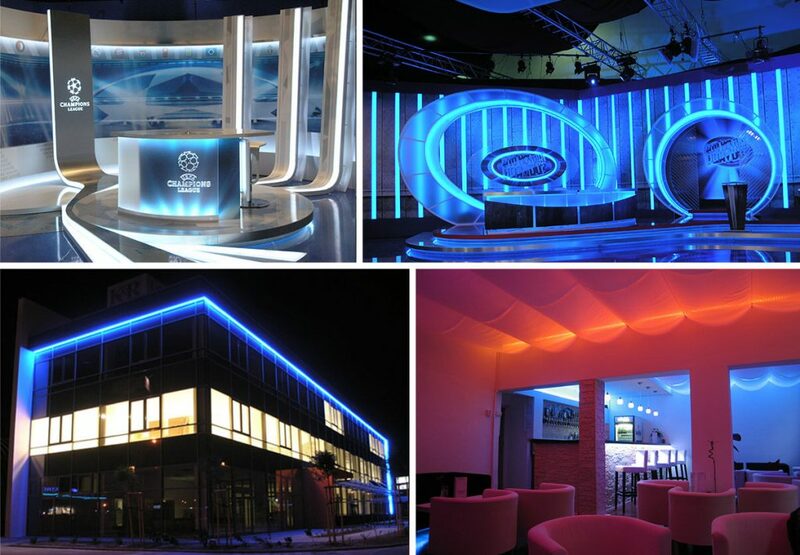 Digital LED strips can be used to achieve amazing animated light effects in clubs, TV studios or even buildings. They can be used for decorations, but also for displaying video content for advertisement purposes. Digital LED strips are great for any-shape LED screens. Digital LED strips are usually more complicated to control since you have to provide video content for the LED strips. Users often use computer software, Art-Net, live video stream or SD card as a video source. On the hardware level, the digital strips receive video information over SPI (Serial Protocol Interface). Every single LED of the digital strip uses one chunk of RGB data in SPI data packet. Now, pay attention. You have a little issue with the digital LED strips SPI communication – there is not only one standard. There are many control IC chips and every one of them uses a different kind of SPI signal. The most common types are WS2811, WS2812, TM1803, TM1809, SK6812, UCS, APA102 or APA104. LED Strip Studio system supports all common types of IC. 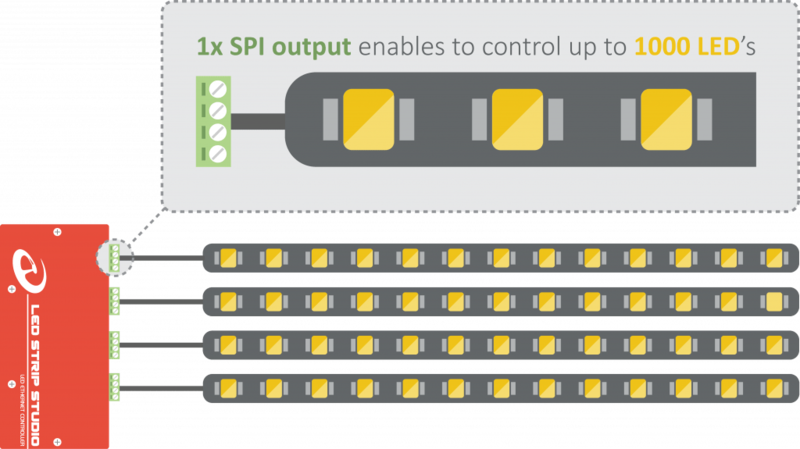 LSS 3 allows you to send signal through output using 4 independent SPI outputs. Each one of them can control up to 1024 LEDs. And that is a huge difference! Typically, the SPI controllers receive video information over Ethernet cables from computer software or Art-Net. But there are also controllers using SD-card or live video stream (e.g. from HDMI) as a video source. 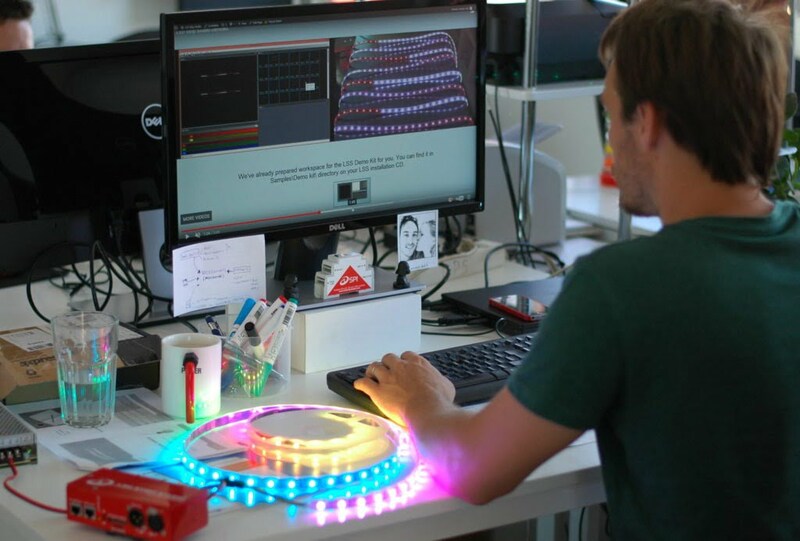 Why start using LED Strip Studio Controllers? 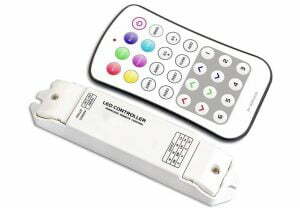 We are offering you great LED Controllers with long tradition, made and tested inhouse and on hundreds of installations. LSS controllers are easy to use, have detailed documentation, strong support, own software solution. 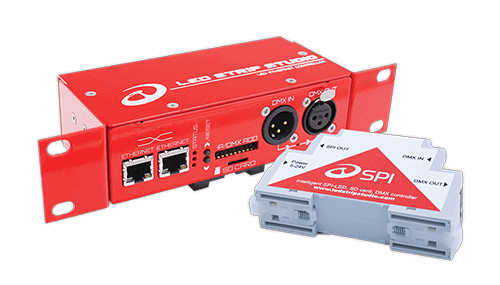 The technical details of LED controllers – LEC 3, SPI LED Controller, SPI Matrix, Powered LEC. Digital LED strips usually works at a 5V voltage, although there are also some 12V or 24V versions (these allow control of only 3 LED diodes as one pixel). We often use 42 LEDs/m version, but you can find many kinds of digital LED strips, anyway. Showtacle , LedStripStudio and their incredible technology help me to realise this project .